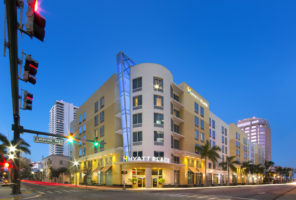 This 6 story business class hotel, which is located in the center of downtown West Palm Beach, wraps a 220 space garage and includes 165 hotel rooms each with wet bar, lap desk, WiFi access and 42” flat panel HDTV. The hotel’s amenities feature a fitness studio, indoor pool, 1,800 sq. 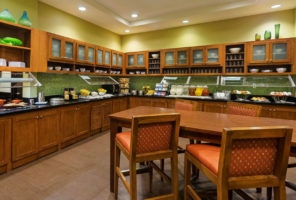 ft. eco-friendly event space with state-of-the-art audio/visual equipment, business center, meeting rooms, boardroom, gift shop, lobby bar, lounge, bakery cafe and restaurant with full commercial kitchen. Due to the hotel’s proximity to adjacent buildings, a vibrofloatation process was implemented to stabilize the soils before beginning vertical construction. Its structure, which is supported by a 3’ thick matt foundation, includes cast-in-place concrete with post tension decking, masonry infill, painted stucco, fixed impact windows and built-up modified roof. A PTAC mechanical system, energy efficient InComm lighting and controls and 150 FPM traction elevators are also included. 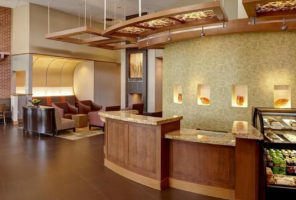 Recessed ceilings, cove lighting, granite and marble tile, carpeting and millwork are among the hotel’s finishes. As construction manager, and prior to commencing construction, Craft spent several months in preconstruction providing budget updates, systems and value analysis, constructability reviews, schedules and logistics plans as design progressed. The $20.7 million project, which required careful planning and coordination, was completed on time and in budget in 14 months.